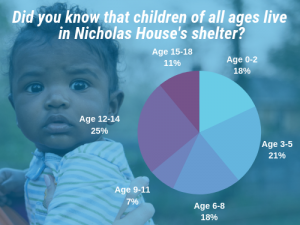 Did you know that 70% of the people Nicholas House serves are children? Click here to learn more about the impact youth services make for the children in Nicholas House programs. Nicholas House is an Atlanta shelter that provides housing to homeless families regardless of family makeup. We provide temporary housing while addressing the root causes of family homelessness so a family may never be homeless again. Take an Open Door Tour! Tours are held every third Saturday of each month from 10:30 – 11:30 a.m. Helping homeless families achieve self-sufficiency. Our mission makes a difference. More than 80% of families maintain their own housing a year or more after exiting Nicholas House.